Network bite the big one? ERD Commander 2000 might just be your savior. 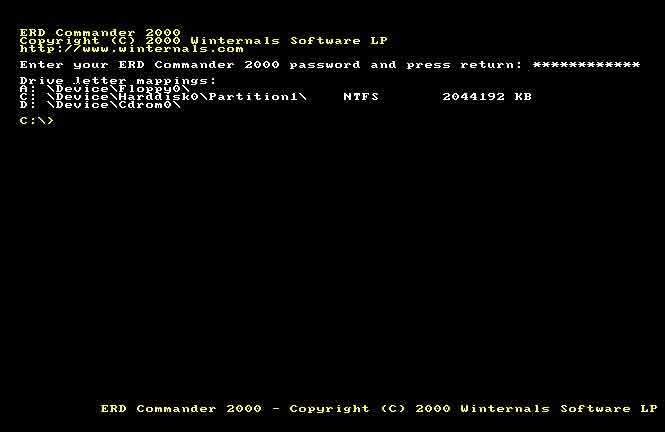 ERD Commander lets a network administrator recover a downed Windows NT or Windows 2000 system by booting into a command prompt-like interface. Over the past few years, I’ve found this application so valuable it’s become my most-used admin tool. When the latest version, ERD Commander 2000, was released, I was skeptical. I thought there was no way to improve this tool. I was wrong. ERD Commander 2000 allows you to boot a downed Windows system via one of three methods: 3.5-inch disks, a bootable CD-ROM, or hard drive. Before the 2000 version, the app was of a bootable-3.5-inch disks-only design. The CD-ROM option, I discovered, is one of the new version’s best features — booting from the CD-ROM considerably speeds things up. ERD Commander 2000 ships on a single 3.5-inch disk, which then uses the NT or Win2K CD-ROM to create the bootable 3.5-inch disks or bootable CD-ROM. It does this by modifying the existing NT or Win2K setup disks to boot ERD Commander 2000. For the security-minded, the application can be password-protected. 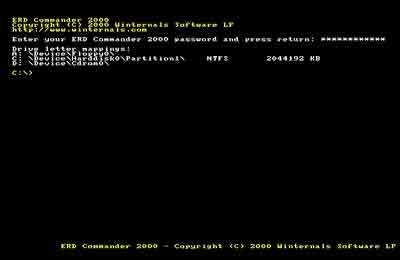 ERD Commander 2000 boots into a DOS-like command prompt, offering numerous tools and commands for recovering a downed system. You have, for example, Registry management tools and file and folder management commands, and you can modify file or folder permissions via the Attrib command. Using the file and folder management commands, you can reinstall corrupt or missing DLL files and copy important system files. With the Service command, you can disable a service causing a Blue Screen of Death, allowing your system to boot properly. The application also makes available all DOS file and folder management tools (CD, MD, RD, Dir, Copy, Xcopy, and Move), along with commands to edit the Registry; start and stop services; and (my favorite) change a user’s password, including the administrator’s. ERD Commander 2000 is extremely powerful, as it provides full access to a downed system and allows you to reset the administrator password. I did find one limitation with the app: It resets a single password at a time. But as this feature is used to reset a lost or corrupted administrator password — it’s a limitation most can live with. ERD Commander 2000 is one of those tools no network administrator should be without. Although the app won’t allow you to recover every failed system, on most occasions you’ll be successful. It’s definitely worth the purchase price and then some.